If you frequently find yourself in need of quick access to an emoji (stat!) you might be interested in a recent Apple keyboard patent which depicts a Smart keyboard with dedicated Siri, Share and Emoji keys. The drawings in the patent show a touchscreen Apple device (most likely an iPad considering the size) attached to one of the company’s Smart keyboards, though it has slightly different layout to accommodate these new keys. In the patent application itself, it’s explained that these keys would be context dependent. For example, the new search key in the top right hand side of the illustration would allow you to search within a word document if one was open, or if you’re in your email app it would allow you to search in there. Double pressing it could bring up shortcuts to your more commonly accessed apps. Finally, if you long press it’ll call Siri to action and enable a voice search. Pressing the share button on the other hand would bring up a host of apps through which you could share the content you have on screen, including Facebook, Twitter, email, and messages. It doesn’t actually go into any detail with regards to the Emoji button, but we imagine it's fairly self explanatory. Rather than clicking the globe key to access the emoji keyboard as you do with Apple’s current Smart keyboard, you’d simply hit this specific key to bring it up immediately. Interestingly, the Emoji key appears to take the place of the Caps Lock key. We don’t really lament the loss of the Caps Lock key. However, we imagine its absence is more likely to do with the fact that this isn’t a design patent (and therefore not entirely visually accurate) rather than because Apple would like everyone to chill out. If we took the patent's illustrations as accurate then we’d also have to assume that Apple has decided the letter ‘E’ is now redundant. 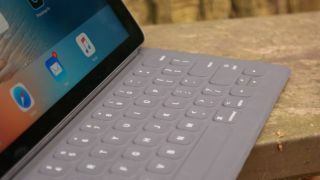 Considering the rumor that Apple is planning to release three new iPad models this year, a new Smart keyboard accessory to go along with them would make sense. Whether or not it would actually have these keys can’t be said – as with all patents we have to take their contents with a pinch of salt as many of them can take years to make it to market if they ever do at all.